The Virgin Islands is once again promoting its Category One ship registry status in Monaco during the 24th annual Monaco Yacht Show, which concludes on Saturday. 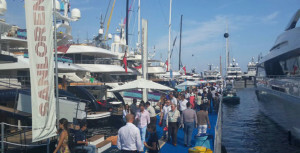 As a Category One shipping registry, now capable of registering the mega yachts of the world, it is anticipated that the Territory will be able to market and attract many more owners and prospective buyers through their attendance at the event. The annual show – the largest of its kind in Europe – brings together all the major players in the yachting industry including boat designers, builders, suppliers and service providers like the BVI. With around 115 superyachts on display, more than 33,000 people were expected to attend the four-day event which brings together buyers, owners and tourists in historic Port Hercule. The BVI is being promoted for all business – Yacht Registration, Tourism and Financial Services, as well as providing information to interested persons who will be visiting the islands for pleasure cruising or chartering services. The BVI delegation is comprised of BVI Tourist Board Member Julien Johnson; representing the Virgin Islands Shipping Registry are Chief Marine Surveyor Gerard Kenny and Assistant Registrar Ms. Lecia Christopher. Also on the delegation are is BVI Tourist Board UK representative Ms. Ginny Hawksley; Chief Operations Officer in the BVI International Finance Centre, Ms. Maritza Mercer; Customs Officer, Jaber George of Her Majesty’s Customs Department and Ronan Kuczaj of SHRM Trust Services. In sharing some of the highlights of the Territory’s representation at the event, Ms. Mercer added, “The BVI co-hosted a cocktail reception with Camper and Nicholson and Elite Traveler aboard the mega-yacht Bravado on Thursday evening, catering to more than 100 high net worth individuals (HNWIs) in the yachting and private jet world. Additionally, the staff of VISR have also met with individuals who have or are interested in registering their yachts in the BVI. Promotional efforts are also underway as Ms. Hawksley provided interviews with prominent publications to promote the new air concierge service from the United Kingdom via Antigua and VI Airlink flights to the BVI. These included Boat International, Super Yacht World and Super Yacht Business. Also show-casing the BVI are yacht-related websites which include YachtingPages.com, SYOG.com (Super Yacht Owners Guide) and Chic and Style, which is a luxury lifestyle website. The BVI Tourist Board has also connected with Aston Martin Lagonda Limited, a British manufacturer of luxury sports cars and grand tourers. It is anticipated that furthers discussions will be held in London to discuss potential joint marketing opportunities. The BVI attained Category One shipping registry status on June 4, 2013 with the tabling of an Order in Council in the United Kingdom Parliament.